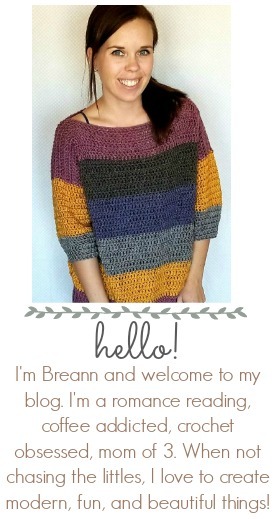 The front of the sweater is a solid piece, made with all double crochet. The back has the open, see through look that is just so cute! I like to wear it with a brightly color tank top. Even just a sports bra would be adorable! Here you can see a close of the design on the back of the sweater. -Get the complete free pattern below or this pattern is also available as an inexpensive, clearly formatted, PDF instant download in my Etsy shop or Ravelry Shop! This is the length of your sweater. Test the length and add or take out rows as needed. Make sure to end on a row 9 repeat. Mark where you want the armholes to be (I tried the sweater over my head to see where I wanted them) I marked about 11 rows down from the top. 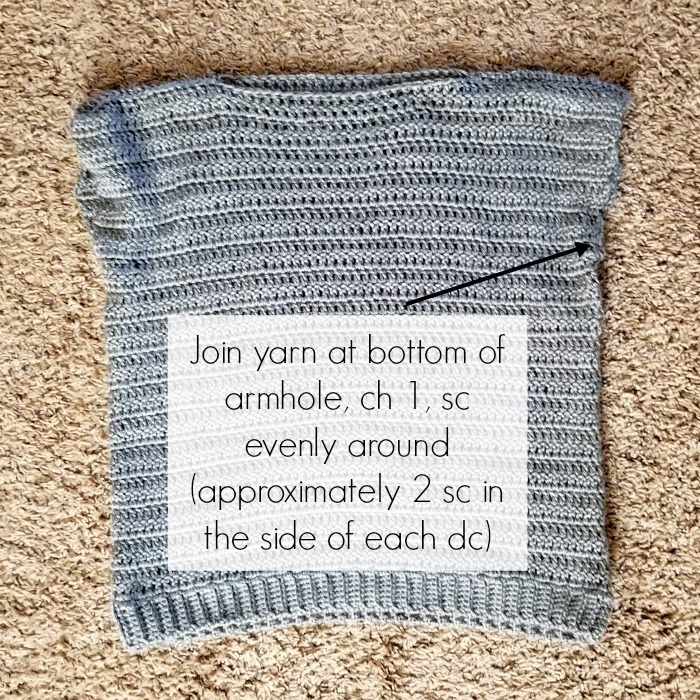 Using a long piece of yarn and a yarn needle, sew the pieces together with a whipstitch, leaving a space open at the top for armholes. Fasten off, weave in the ends. Turn right side out. Thank you very much! 😘 Do have video tutorial? I would love to make this pattern. please put me on the mailing list. Classy design and straightforward instructions. Can you send this to me via video. I do better when I see it done step by step. Plus I am just a beginner. Hi, I don’t have a video tutorial available. Hi! The top is beautiful. Will it be okay if I make the back similar to the front. So , repeat the front twice and join? Thanks. I have never made a jersey before so am chuffed with this one. Just finishing the sleeves. Put my own spin on it a bit by doing two pattern repeats of the back just above the chest. Love it. Thank you so much. No, I don’t think you’ll need to decrease further. Can you make it without the sleeves? I like this top very much. A “younger” would probably like it open on both sides wearing a tank etc. underneath as you’ve suggested. I’m going to make this for the early fall. Thanks for sharing your work! Love it! I initially came to check it out assuming the front and back were the same. I like the open, airy, look. “The band is he width of your sweater.” [slaps forehead] Genius! That way I just keep going till it’s the length I need. Why didn’t I ever think of that before? And why have I not seen that in a pattern before? Speaking of patterns, I started to copy and paste the pattern from this page into a document to print, then decided to just buy it for $1.99. Well worth it. It’s laid out very nicely with photos. I would’ve have spent a lot more than $1.99 worth of my time copying and pasting. Appreciate it. Please could you tell the equivalent yarn for a UK crocheter. Aran weight yarn in uk…according to my google search! But 5mm hook is generally Aran so figure it’s a safe guess. 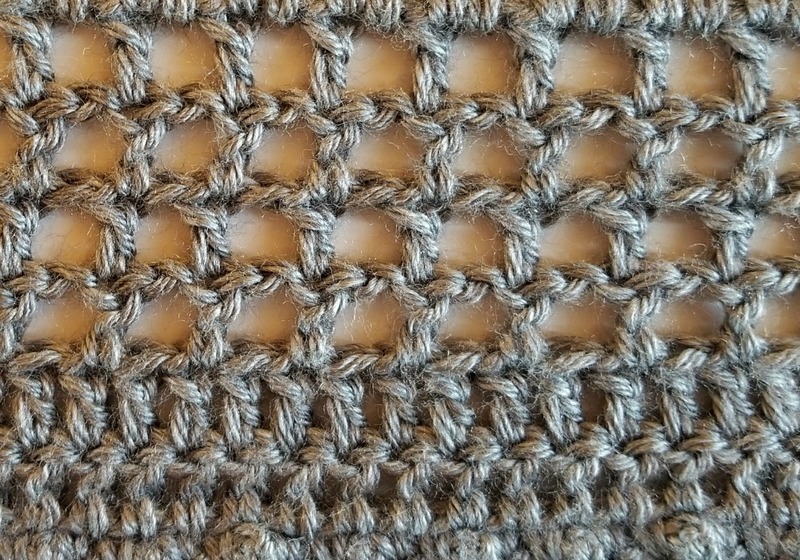 Hello, I love this pattern but am confused about rows 3,4, and 5 ending with a chain1. Then one is supposed to chain 4 for the tun. Doesn’t this become a chain 5 then? Please help me understand what I’m missing. Thanks. Hi! You should end the row with a dc in the turning ch. By the way I choose to make the front same as the back and with sorter sleeves. the width and length is that based from craft yarn council woman size chart? Also is the width size based all the way around or just the front or back base? The width across the front when the piece is laying flat. The width and length is based on the finished piece and gauge. 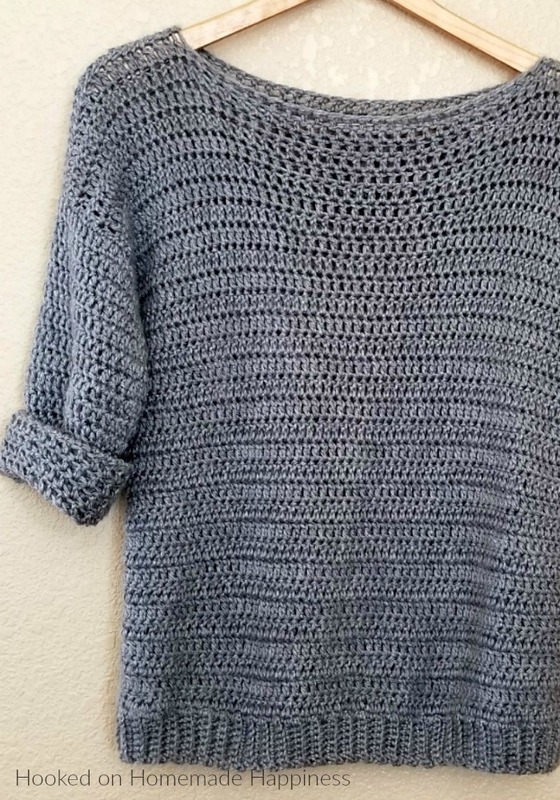 Made this “Simple Crochet Sweater” as my very first sweater and the instructions are so wonderful. I made the pattern on the front and back AND made it open in the front. It’s so simple and easy, thank you Breann! 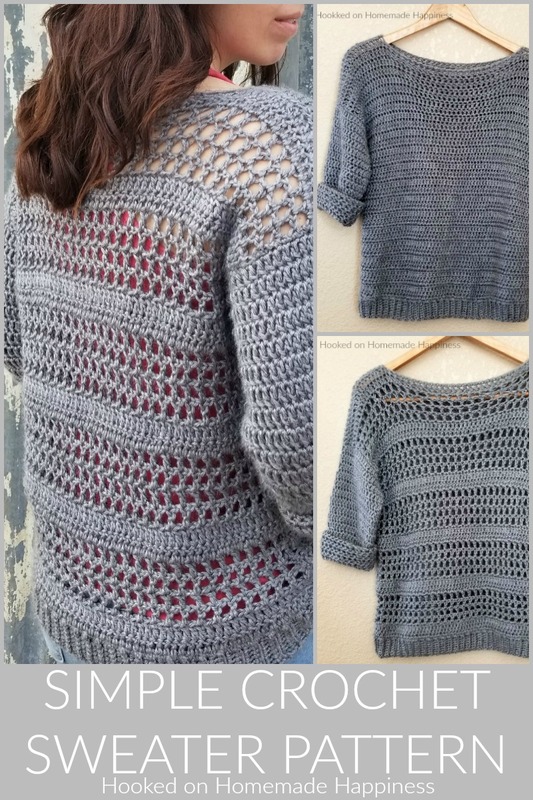 I am not good at altering patterns….could you tell me how you made this sweater with the open front. Thank-you. Love this pattern! 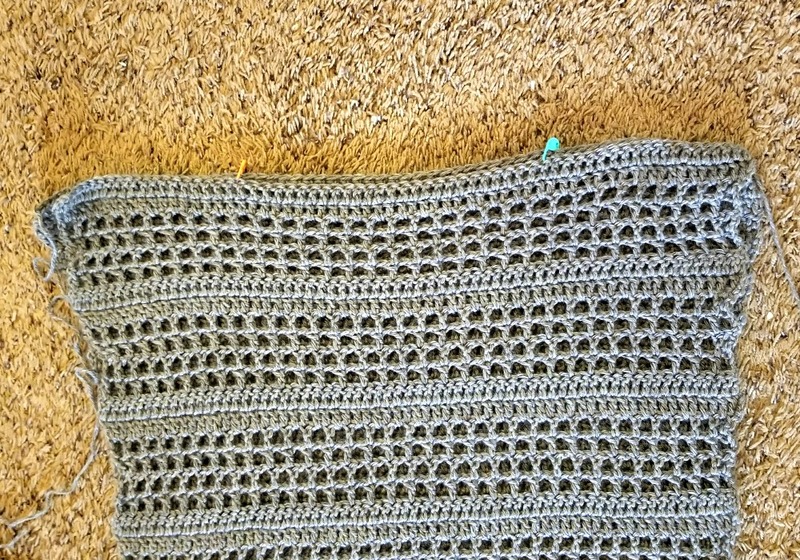 What adjustments would I need to make when using a category 3 weight yarn? Hi! Thank you so much! 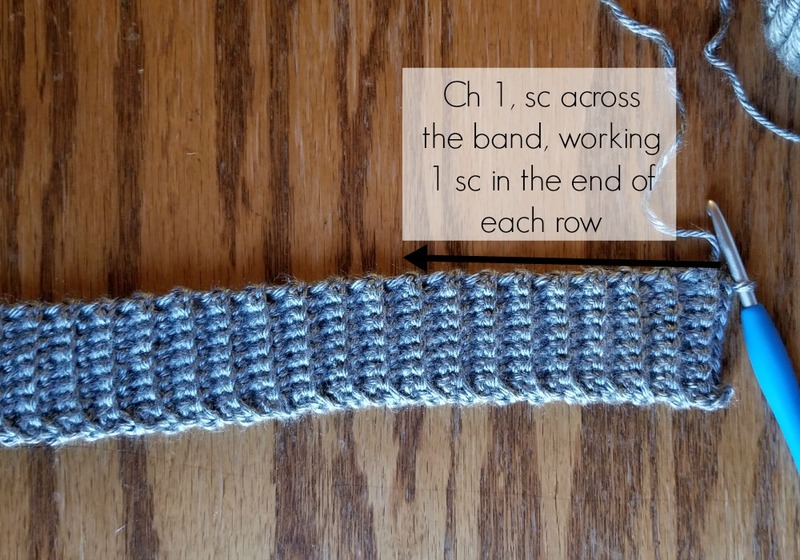 When starting with the ribbing along the bottom, I would just keep going until it’s the measured width (make sure there are an odd number of rows). Hope this helps! Hello! Beginner here. I love this sweater! I managed to make the back piece with no issues, but am now struggling with the simpler front (go figure!). Does the chain 3 count as a double crochet? I was counting it and was ending up short on stitches… now I’m not counting it and I have extra?? Any help is much appreciated! Has anyone tried making the sleeves without the decreases? How does that look or turn out? 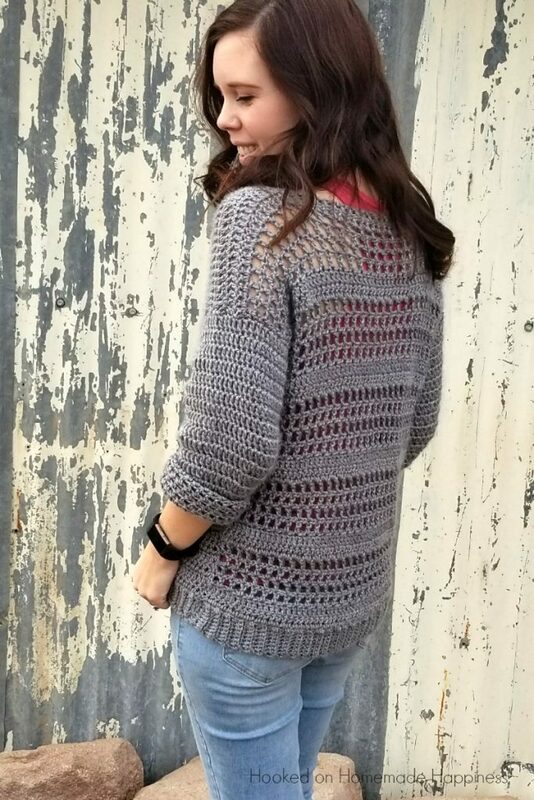 I’m a bit large but would really like to make this sweater! Could you give me instructions for a size 3X? Hi! I would use a sweater you own and base the sizing off that. 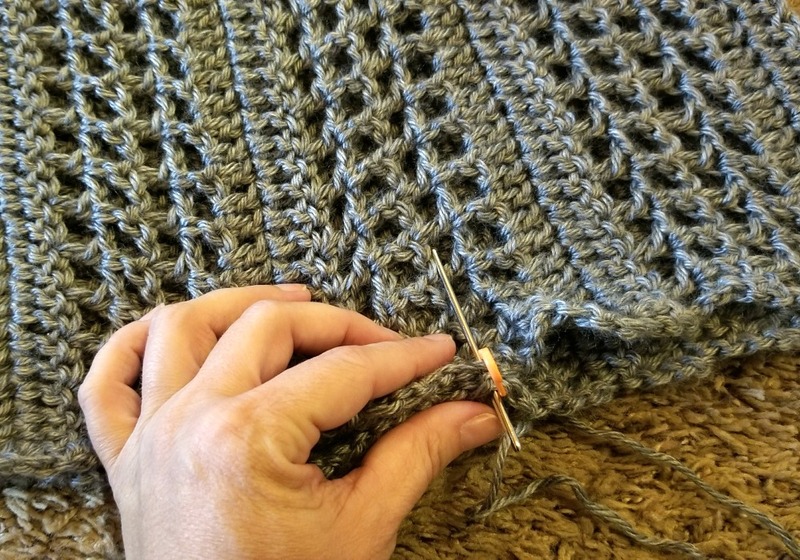 The sweater starts with the ribbing along the bottom. This is the width of your sweater. Make the ribbing until it’s the width you want (must be an odd number of rows) and then follow the pattern. I hope this helps!! Could you tell me if this is in US or UK crochet terminology? I love the sweater, but I prefer a v-neck. Can you adapt this one or do you have a similar pattern with a v-neck. Hi Breann I’m on rows 4-7 and it says to chain 4. That counts as a dc plus chain one. Then to skip a stitch. I’m having trouble making the 45 stitches if I don’t dc in the same stitch as the chain 4. What am I doing wrong. Hi! How many dc are in your previous row counting the ch 3? Also, when you ch 4 and skip 1, your first dc with be in the 3rd stitch of the row. 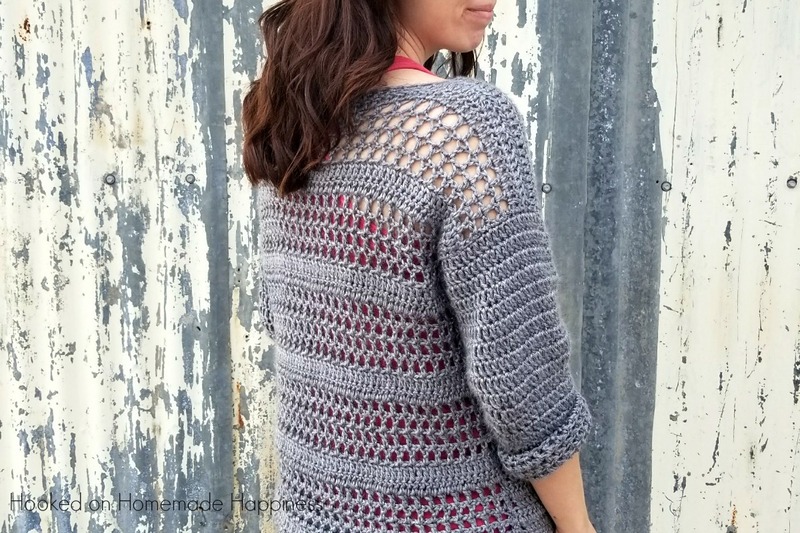 Alright, I totally fell in love with sweater and made it up just as the pattern is written in Caron Plum Perfect and got a purple tank top for underneath. Breann, talk about gorgeous, I was so excited to add it to my wardrobe!!!! Bad thing though, I showed it to one of my bosses wife today and she ordered one from me. Then I showed my daughter this evening and she took it from me!!!! Well back to the store for more yarn. As you can see this is really a big hit around here! Breann, I’m just finishing up number 5 (the one for my self, 3 daughters and the boss’s wife)!!! So in 4 weeks I’ve managed to make this many. I would say this is a crochet record for me!!! 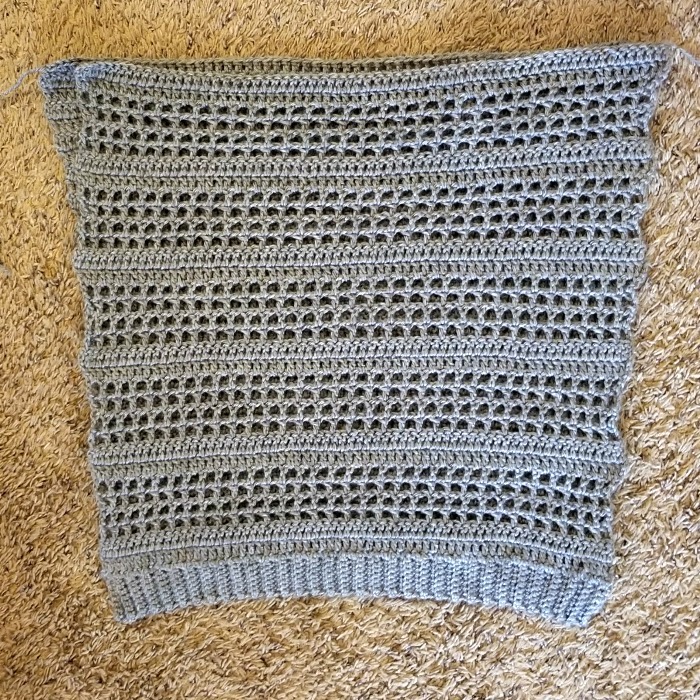 First off all thank you so much for this pattern. I really fell in love with the simplicity of it. However now i reached row 8 of the back part i am slightly confused what to do with the last sentence which says: ‘ch space across’ I made the DC in every stitch, but do i know just chain one to then start row 9? just skip a stitch do then start row 9? or something i am just totally missing out on? Hi! In the previous row (row 7) it’s all dc and ch spaces. Then row 8 it’s a solid dc row. Make sure to dc in each dc and ch from the previous row. Hope that helps! 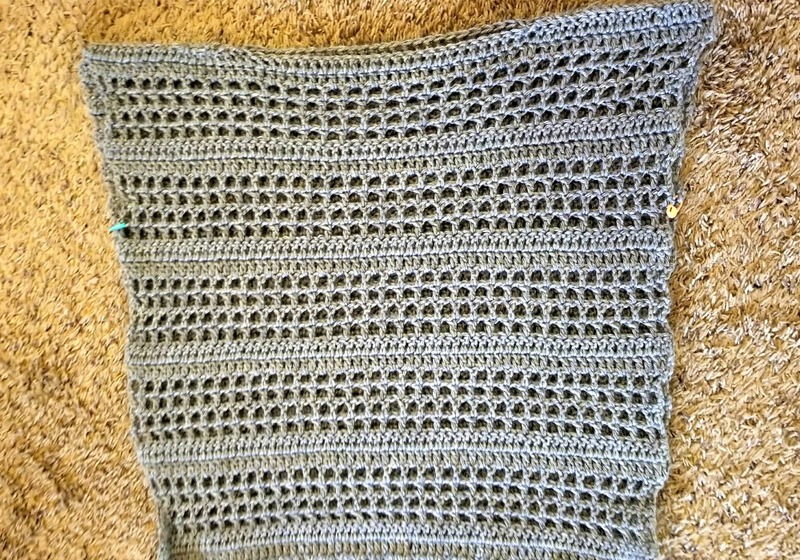 Hi I love this pattern, do you think it would work in a super bulky yarn and if so what hook size would you recommend? I’m in the UK. Thank you. 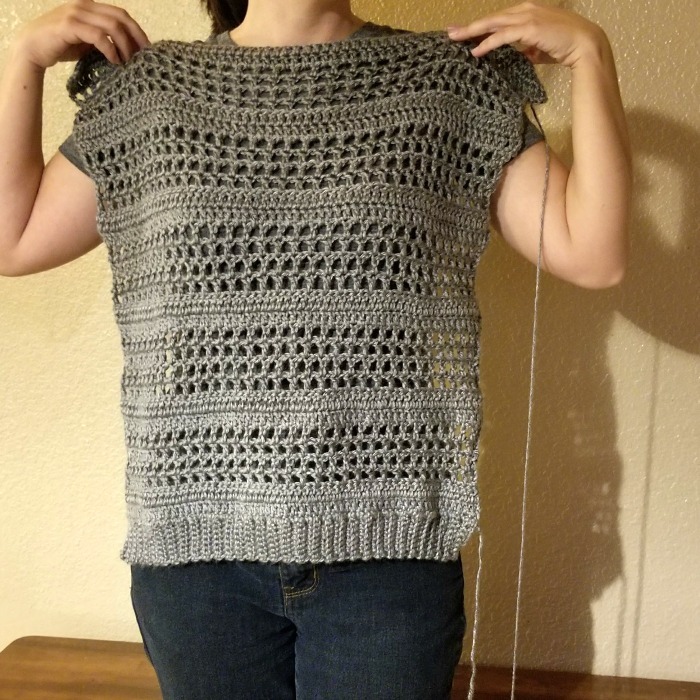 This was a very lovely pattern .Thanks for sharing.I made 2 short sleeves one with both sides as the front panel and another one following yours.both came out beautiful!! Hi!Lovely design! SimplE and easy to follow as well for a beginner. Can the sleeves have ribbing as well. If so how many rows would be required for medium size. How to get the same type of fall as you have shown in the picture. Thank You for your prompt reply dear. But as per your pattern, I think you had continued crocheting around the armhole. So in that case, the ribbing has to be done separately and attached right? Thank you once again. What other finishing do you recommend for the finishing for the long sleeve other than ribbing? Do you think using a mix of front and the back would affect the sizing of the sleeves? Hi! Love this pattern. Do you think it can be made in 2 colours? I want to go the front in the grey and the back in alternating grey/pink! No. I just can not manage it. I am in despair now. I have 46 stitches here and the sleeve is getting wider and wider. Why? That does not look good. 😔😔😔 can I send you a picture by email? So you look at this? Yes, email me at hookedonhomemadehappiness@gmail.com. Do you have the same amount of stitches in each round? It should not be getting wider. I would to make this as a cardigan with Premier Cotton #2……what size would I do? Plus I would like short sleeve to the elbows….would I just stop at the desired length? Hi! This sweater is really customizable. It starts with the ribbing across the bottom. I would make that the width you want (as long as it’s an odd number of rows) and then make it as tall as you want. You could use one of your sweaters from your closet for comparison 🙂 And yes, for the sleeves, just stop as desired length. 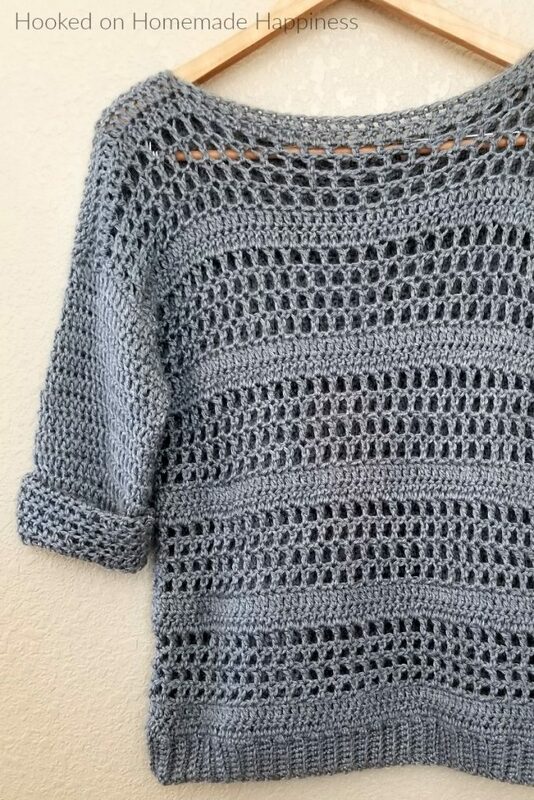 Thankyou for producing such a lovely garment, I have just finished it and it has turned out just like yours, so pleased considering it is my very first written pattern I have followed and also new to crocheting.